7.25"x8.5"-12 Month-MousePaper® Calendar printed on recycled paper. Mouse Pads have your message printed on each month. Calendar mouse pads are a promotional "triple-threat" giving you the full impact of a monthly calendar, note pad, and mouse pad. Decorate your desk with a vibrant MousePaper Calendar 12 Month Paper Mouse Pad at your work station or home office. This thick mousepad will sit on your desk without sliding and is a great canvas for your business logo or image. 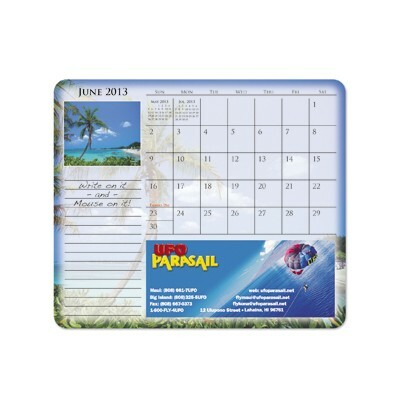 The pad doubles as a calendar with each page displaying the month while also acting as a mouse pad.